Several factors are taking root vegetables out of the culinary (and metaphorical) cellar and onto plates everywhere. The trend among restaurants and caterers to use locally grown ingredients has spread to the home cook, as well, and many people are shopping in farmers’ markets for the freshest produce possible. And, as people make the shift from a supermarket state of mind to a local-market mentality, the root vegetable is making a comeback. Root vegetables, particularly potatoes, carrots, and sweet potatoes, have long been considered staples, albeit neither glamorous nor exciting. Now, however, retro is in and the lowly root vegetable has gone from staid and boring to hip and trendy. 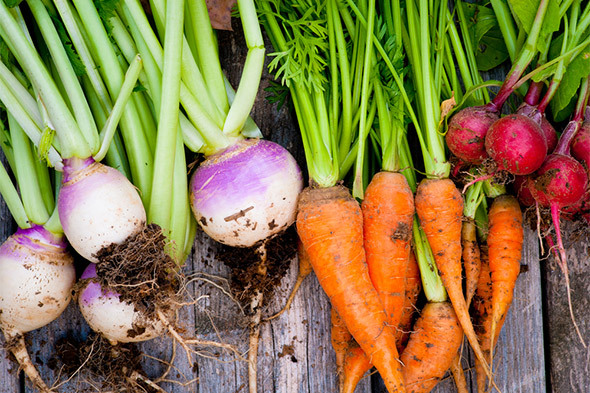 Root vegetables are literally the roots of a plant. Some root vegetables — carrots, radishes, beets and sweet potatoes — are familiar to just about everyone, while others, such as parsnips, turnips, rutabagas, kohlrabi, celery root, Jerusalem artichokes, and ginger, are a bit more esoteric. Strictly speaking, a root vegetable is the underground, edible portion of a plant. Botanists make distinctions between “true roots” and “tuberous roots” and other non-roots that grow below ground such as “tubers” and “rhizomes” and “bulbs.” The root is one of six parts of a plant: the root, the stem, the leaves, the flowers, the fruits and the seeds. Plants anchor themselves into the ground with their roots, drawing moisture and nutrients through the roots into the above-ground stems and leaves. Many of these roots are inedible; however, root vegetables are the roots of certain plants that swell up to form an edible root. Carrots are arguably the most well-known and omnipresent root vegetable. Carrots are a famously good source of vitamins A, K, C and potassium, making them a perennial favorite of consumers who want food options with health benefits. Many other root vegetables are high in beta carotene, vitamin C, minerals and/or dietary fiber. 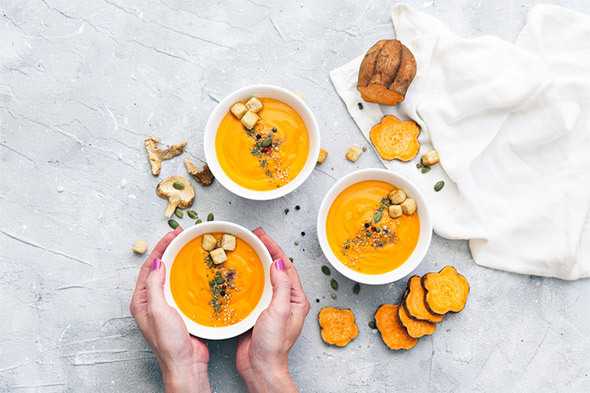 As we all continue to look for healthful ingredients to improve recipes, the vivid colors and earthy flavors of root vegetables can offer dramatic presentations, while having the added benefit of being economical. Just around 100 years ago, most country estates had “root cellars,” where vegetables were stored over the winter. Advanced refrigeration and transportation put an end to most root cellars, however, these days with widespread sustainability movements and locavore trends, traditional methods of storing produce is making a comeback to kitchens around the country. Environmentally aware consumers want to use locally harvested vegetables all year round and so, variations of old-fashioned root cellars are cropping up, where hardy vegetables can survive for months. You don’t even need a cellar to have a root cellar! All you need for this type of storage area is a room that is cool, dark, and humid; it can be underground, but it can also be any room of any house that meets these criteria. The idea is that the temperature (between 34 and 40 degrees F) and the lack of light can slow the ripening process and hinder decomposition, with humidity that will keep the vegetables crisp. Root vegetables are plentiful in the fall and winter and, under the proper storage conditions, they can be stored and used throughout the year. There are even spring and summer root vegetables, like spring parsnips and fennel. Root vegetables aren’t pretty; nor are they fragrant like fruits or luscious leafy greens. However, their charm lies in their unique taste and in the bounty of vitamins and minerals they absorb from the soil. They’re also fat-free, a good sources of fiber, and each one has a unique set of healthful nutrients. Root vegetables need little care – not even refrigeration. However, don’t wash root vegetables before storing them. Wait until just before you use them and then rinse them off, although you can trim them before storing. The parsnip is having a moment. Their shape is similar to turnips or white carrots, but the taste is sweeter – more like celery or potatoes. Parsley root and parsnips are related – and very often confused. Parsnips are very mild and sweet in flavor, while parsley root has a stronger, herbier flavor. (The debate rages on about whether they can be used interchangeably.) Parsnips can be roasted like potatoes, which preserves their nutritional goodness; they can add sweetness to soups and stews; or be fried up like chips. The parsnip is also related to fennel and celery; it is planted in the spring and harvested after the first frost of late autumn. The pale yellow roots are 9-12 inches (20 to 30 centimeters) long with a diameter of 2-3 inches (5 to 8 cm). Parsnips, like potatoes, are rich in starch and very nutritious. Parsnips contain a high proportion of essential oils that contribute to their characteristic, spicy-sweet aromatic flavor. They contain minerals such as potassium, phosphorus, calcium and magnesium, and compared to carrots, their content of vitamin C is slightly higher. Root vegetables can be the basis for an entire warm, comforting meal, as explained in the New York Times article entitled, “Building a Meal Around Root Vegetables.” But perhaps more than any other use, they are substantial vegetables that can be pureed into soups, which then don’t need other thickeners too boost their hardiness. In a large pot, heat oil over medium heat. Add onion and season lightly with salt and pepper. Cook until translucent, about 5 minutes. In a large bowl combine all prepared vegetables. Add vinegar, olive oil, rosemary, salt and pepper. Toss to combine. Spread vegetables onto large sheet pan in single layer. Roast in oven at 450°F for 30 minutes (without turning or stirring) or until vegetables are fork tender, well browned and caramelized around edges. Remove from oven. Taste; adjust seasoning as needed. Serve hot or room temperature. When winter rages, our thoughts wander to the comforting tastes of hot, satisfying foods. 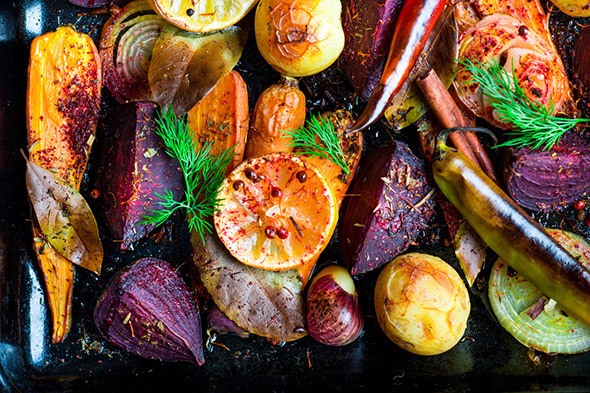 Root vegetables, which can be roasted, grilled, and braised, or turned into soups, gratins, or chips, are the perfect antidote to the winter blues. Feel free, however, to enjoy the root vegetable revival all year long. With its deep satisfying flavor and its nutritional value, the root vegetable’s comeback to the kitchen of the trend-savvy cook is well-deserved. This entry was posted in Cooking Tips, Food Guides, Recipes and tagged healthy, hearty, root vegetables. Bookmark the permalink.